Large Luxury cottage in Cromer, Norfolk. 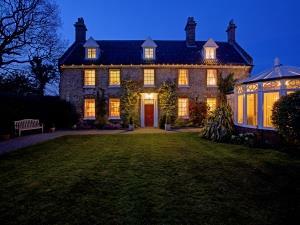 Incleborough House offers luxury 5 Star self catering in Norfolk for up to 16 people with 7 bedrooms. Our luxury large and big self catering house is set in a magnificent half acre of secluded and private mature English walled gardens overlooking the village green. Incleborough House has been converted into what is thought to be North Norfolk's newest and most exiting large and big self catering venue. The television lounge is of a classical design and is festooned with luxuries such as remote real flame fires, leather sofas, FREE Wi-Fi and top of the range 50” 3D TV (with Sky+HD) and Blu ray DVD package ‘plus the Grundig stereo system. To further entertain the whole family and friends there will be a stunning 'state of the art' hot tub, full size Pool and Ping Pong tables, Sony PS3 and Nintendo Wii, plus oodles of traditional board games. Classical solid light oak and granite kitchen will boast a ‘supersized’ Aga for the party cooking plus American fridge freezer to store all the holiday food goodies. Don’t worry about the washing family and friends there will be a stunning 'state of the art' hot tub, full size Pool and Ping Pong tables, Sony PS3 and Nintendo Wii, plus oodles of traditional board games. Classical solid light oak and granite kitchen will boast a ‘supersized’ don’t worry about the washing up, there’s an optional housekeeper* on hand each day if needed and two dishwashers just to make sure. (*charges may apply). There are sumptuous en-suite bedrooms with huge beds, beautiful linen and fabulous décor with super views, shining contemporary bathrooms with under floor warming. Don't forget the complimentary gourmet welcome pack which includes a selection of wine, gorgeous homemade bread and cakes on your arrival. Cycle storage available. Exclusive and private hot tub included. Pool table included. Ping Pong table included. Children welcome from any age. May Sale Now On: + Monday 6th May break from £695.00* Also, £500.00 off summer holidays 2019: Ring for info & *T&C’s, up to 16 guests, inc Champagne, milk and home made cake on arrival plus LUXURY HOT TUB ! Incleborough House Luxury Self Catering offers weekly bookings starting on Friday and sometimes short breaks.